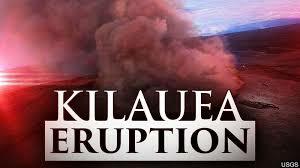 Breaking News: Hawaii’s Kilauea Major Earthquake Hits As Lava Enters Ocean In Kapoho The lava is coming from fissure 8, which officials say continues to feed a large channelized flow traveling along Highway 132, the Pahoa-Kapoho Road. At this time, officials warn that both Highways 132 and 137 remain shut down due to lava inundation. The lava flow also led to the rescues of three people who were trapped while in the isolated areas of Kapoho and Vacationland. They were airlifted out of the area by county rescuers, according to officials with the National Guard on Sunday morning. Meanwhile, a preliminary 5.5-magnitude quake rattled the Big Island just before 4 p.m. Sunday near Kilauea. No tsunami was expected from the quake, which is among the strongest of the 500 smaller earthquakes recorded between Saturday and Sunday. USGS officials said the high amount of seismic activity was the most earthquakes recorded in a 24-hour period on Hawaii Island. This entry was posted in Uncategorized and tagged 500 earthquakes, airlift rescue, crator earthquake, fissure 8, Kilaeau eruption, Kopoho lava entry, love. Bookmark the permalink.